A multi-million dollar renovation is underway at the Gulf of Maine Research Institute. Students will be able to study ocean temperatures, lobster population and more thanks to content provided by NASA. PORTLAND (NEWS CENTER Maine) -- With help from astronauts, Maine scientists and students will work side-by-side to try to get to the bottom of what's happening in the ocean. 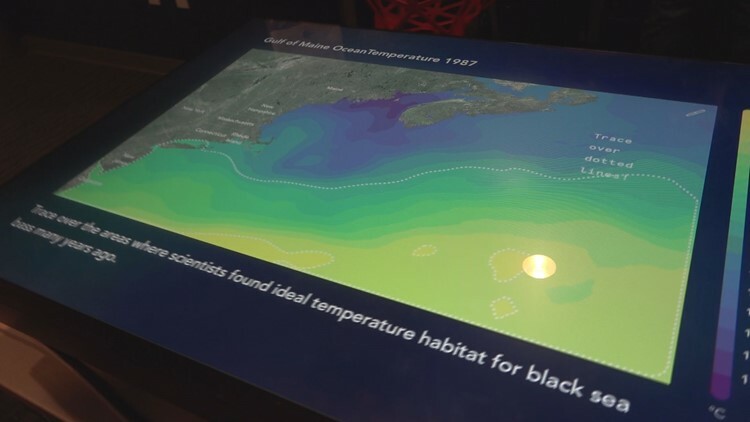 It's thanks to new interactive technology at the Gulf of Maine Research Institute. Inside, the Cohen Center for Interactive Learning is undergoing a nearly $2 million renovation. It will soon be home to ten giant digital surfaces that include content from NASA. It's to support the LabVenture! program which gives 5th and 6th grade students hands on research experience, at no cost. They'll even send a bus to pick up students -- anywhere in the state. Once construction wraps up in September, students will help scientists by conducting digital dissections or collecting data from a live lobsters. "The science that kids work on is the science that our own scientists are doing here at GMRI," said Leigh Peake, chief education officer at Gulf of Maine Research Institute. "So they're working on questions that haven't been answered yet." For example, researchers are currently studying a recent discovery off the coast of Maine: black sea bass.